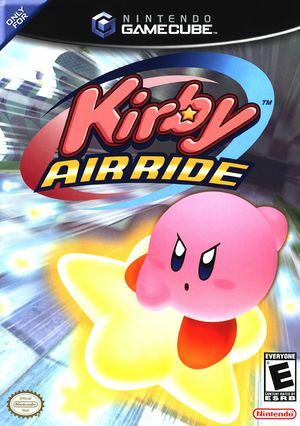 In Kirby Air Ride, players take control of Kirby or any of his multicolored counterparts to compete in races or other minigames on vehicles from the Kirby universe, such as the warpstar. The vehicles use very simple controls: no input is necessary for the craft to move forward, the analog stick is used to steer, and one button performs all functions, including braking, charging up for a boost, sucking in nearby enemies, and gliding. The game has three modes, and each has a "checklist" of list of hidden challengers for the player to discover, which unlocks additional tracks, characters, and items. To play properly in 16:9 and eliminate Object pop-in at the edges of the screen during gameplay, before booting the game, use one of the following Gecko codes. Note: Start Dolphin with these settings - Disable Widescreen Hack in Graphics/Enhancements and set Aspect Ratio to Stretch to Window in Graphics/General. The graph below charts the compatibility with Kirby Air Ride since Dolphin's 2.0 release, listing revisions only where a compatibility change occurred. 3.0 Windows 7 Intel Core i7 @ 2.2GHz NVIDIA GeForce GT 540M Playable, Random freezes becoming more frequent, audio stuttering/looping to the point of insanity. 3.0-799 Windows XP Intel Core 2 Duo e8400 @ 3GHz NVIDIA GeForce 7300 LE 45-55FPS average, Sometimes run at 60FPS, but speedhacks are required. All music in the game randomly loops and pauses, Crashes 5-15 minutes into the game. Also tested the game's split-screen muitiplayer mode with another player, Framerate drops A little bit more in muitiplayer (38-51FPS average). 3.0-843 Arch Linux Intel Core i5-670 @ 3.47GHz AMD Radeon HD 7950 Perfect, though had to use DSP HLE for sound; LLE caused frequent sound loops/stuters and general slowdowns. 3.5 Windows 7 Intel Core i5 @ 2.3GHz NVIDIA GeForce 4200m Good frame rate on lowest settings. Frequent music looping and stuttering. Random crashing every 5 or 10 min. 3.5-1757 Windows 8.1 AMD Phenom II X6 1045T @2.7GHz NVIDIA GeForce GTX 660 Ti 0FPS, never starts. 4.0.1 Windows 8.1 Intel Core i7-3630Q @ 2.4GHz NVIDIA GeForce GT 750M Nearly perfect, Direct X 11, 46-59FPS average on single player, used settings as of the Dolphin wiki's recommended, "purple haze" in far distances of map fixed, no texture errors observed, no crash observed, audio not tested, but used LLE. This page was last edited on 13 April 2018, at 19:59.